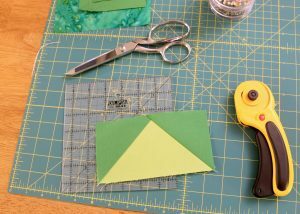 Martingale graphic designer Tara is back to share another tale about her adventures as a beginning quilter! This time Tara tackles a pinnacle of piecing: Flying Geese units. Let’s all cheer her on—and offer some advice for the question she’s been pondering. My last post ended with me teasing that my Rainbow Runner quilt top was too easy—well it really was. All I had to do was sew a long, straight line…22 times, of course! I got plenty of practice. I appreciated Pat Sloan’s tip to use painter’s tape on my machine bed to ensure a consistent ¼" seam allowance. My stitching was still wobbly, which distressed me in the moment, but once I finished and flipped it over, I couldn’t see any wobbles—it looked good to me! I’ll probably be keeping the tape on my machine for quite a while. This is the part where I realized I should have made all my strips the same length as well as the same width! Live and learn. My runner was coming together nicely, but so far it was all just a bunch of rectangles—I had a hankering to try a more challenging block. I settled on the Sawtooth Star, a.k.a. Block #7 from Pat Sloan’s Teach Me to Make My First Quilt. It was perfect because the finished size is quite large at 12″ x 12″. I figured I could make and finish just one block and call it a place mat in the end. I was amazed at how easily it came together. Just cut a few squares and do what Pat Sloan tells you, and voilà, you will have an impressive-looking star (and a few leftover flying-geese units)! That’s Pat’s block on the left and mine on the right. Don’t worry—I see the difference! I’m told my seam line-up is pretty good for a beginner, but I can see how this can become a tricky thing to get juuust right. I really enjoyed putting both of these quilt tops together—I definitely got “in the zone.” One day I committed only to setting up my sewing space and getting all my materials together, and all of a sudden I was almost finished with the task itself because I was so immersed. Does that mean I’m officially infected with the quilting bug? 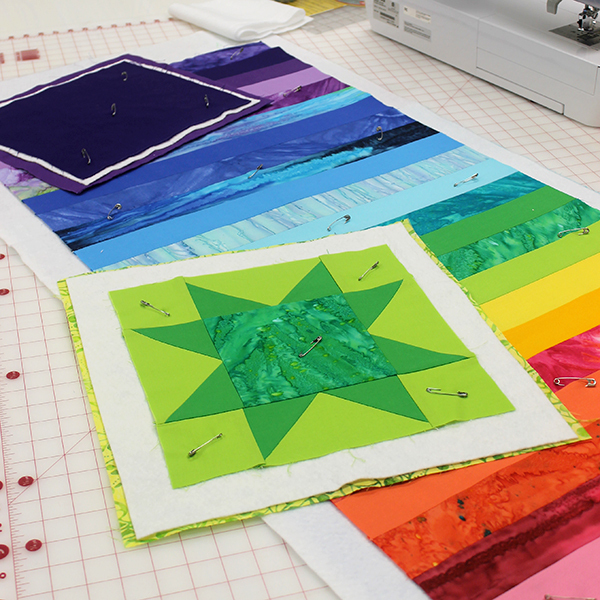 The next step seems like the toughest part—actually quilting. As you can see, I have three “quilt sandwiches” (my favorite term!) all ready to go—the Rainbow Runner, the Sawtooth Star Mat, and a wholecloth practice sandwich. So . . . how should I quilt these? I’d love your ideas, because I really don’t know! 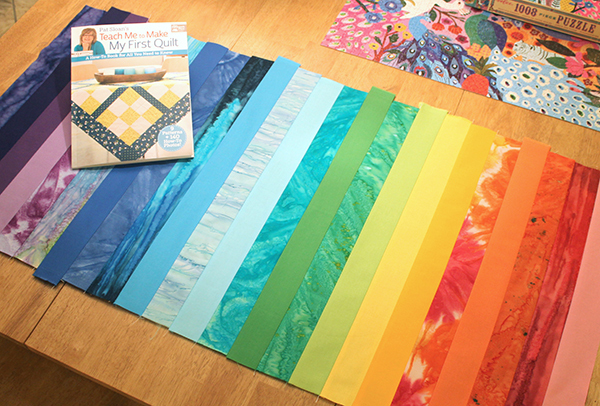 Someone suggested “matchstick quilting” for the Rainbow Runner, and that sounds good. Maybe in a diagonal direction, though. Or even criss crossing? Or perhaps some gentle or quirky vertical curved lines instead so I don’t have to be so straight? And for the Sawtooth Star Mat . . . Should I simply stitch in the ditch and then do something special in that center square? And if so, what? Oh gosh. Help! I do a lot of straight line quilting. From corner to corner, top to bottom, side to side, depending on the project! So far I have only quilted with a walking foot and I find it to be my preference. Sometimes I suggest a decorative stitch on the seam lines of table runners like yours, so even if you stray a little, it will still look nice and is much easier to do than stitch in the ditch. Even simple zig zag or the stitch I call the "heart beat" stitch will look nice. It’s also fun to use variegated thread with so many colors. Personally I think the rainbow color is fantastic and should lead in the visual impact. Use monofilament thread. 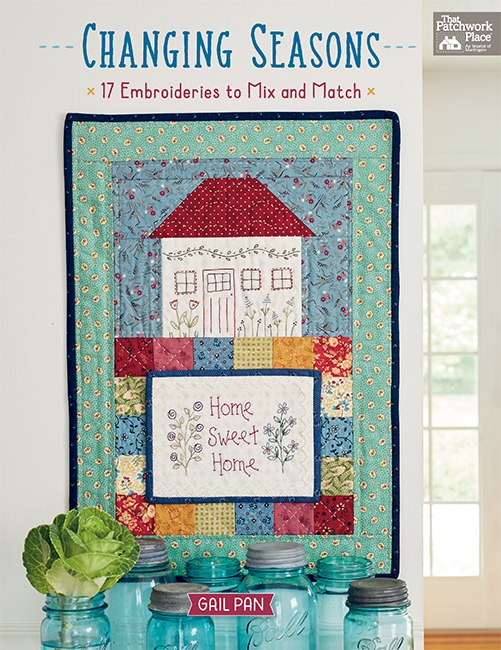 It lets fabric color take center stage and the quilting won’t take over. 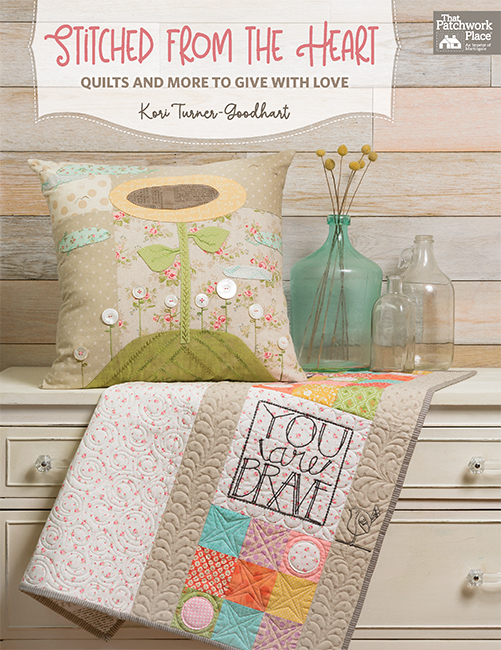 It also lets you get into the rhythm of quilting with practice that is quite forgiving to a new quilter. I look back on my first projects with pride and don’t worry about the mistakes. They are there but don’t show up as much like with contrasting thread. Have Fun! I would suggest that you use the striped runner to test your stipple/meander skills. 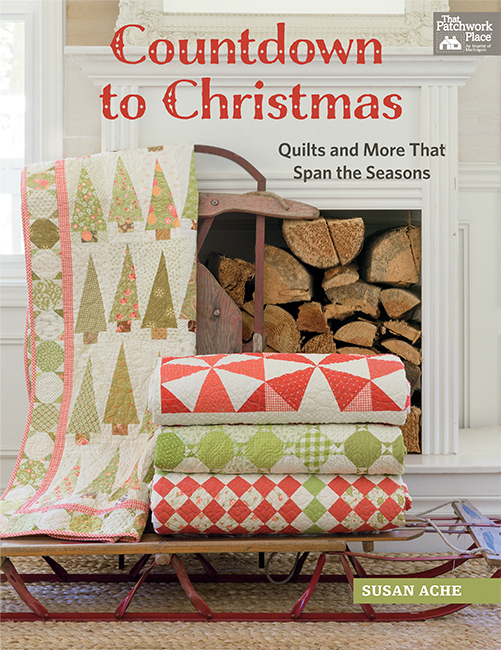 Or how about free motion quilting like stylized feathers or leafy vines? Curved lines that frame the squares and geese on the star, and you could practice the crosshatching inside the center square. Just have fun, and most of all, remember this. This is YOUR project, YOUR designs, and YOU get to do it anyway that YOU want to. Just have FUN! For the runner, for a modern look, you could use your walking foot and sew very gently curving wiggle lines the length of the runner. Then go back the other way, doing the same thing until the runner is covered. Just don’t try for parallel lines! Sometimes they will get closer and then move farther apart. It’s a nice organic look and easy to do, as you will be quilting right over the seam lines, and you don’t have to worry about making straight lines! You could use a variegated thread with several bright colors, or pick a neutral in a thin thread (60 weight cotton or, one of my favorites, 100-wt. Kimono silk from Superior threads; it barely shows the thread but gives you good quilting lines. I would choose a light gray or off-white. I’d like to see circles on the rainbow runner to contrast with all the straight lines. Some single ones, some smaller ones inside bigger ones (offset of course), some little, some big, some medium. And in variegated coloured thread for even more POP! Parallel lines inside the flying geese, with a stitched star in the open space of the centre square. shown step by step with photos, too. Enjoy! I like to do a circle, but off set! I draw a circle with a glass or small plate then use my guide bars on my walking foot. I sew approx. 1 1/2-2” apparat and eventually in up with it going off the quilt on at least 2 sides! Hope this makes sense. I have given all my quilts using this method away so can’t post a picture! Before trying free motion with fabric and thread. Play with pen and paper. Once you get an idea of what you like, practice that design developing muscle memory. Slowly transition to fabric. But remember, just like learning to write, it’s probably not going to be perfect your first or second try. I am one to do straight line quilting and let the project tell me what to do. Have even gone to bed with a quilt to do and woke in the middle of the night with the perfect idea; and end up very pleased when finished. My machine and a walking foot and I am ready to go. Quilting depends on the tools you have. Longarm vs. home machine. Do you own templates? Do you like to scribble all over the block. Does the quilt have a theme? Spring brings flowers and leaves and then there is the Easter egg. I would put a flower in the center and leaves maybe on the sashing. Practice doodling on paper, then pick a design that feels right. Personally, I find ripples or waves easy to do and nice looking. Spirals and leaves are also great fillers. Whatever you choose, relax and have fun!